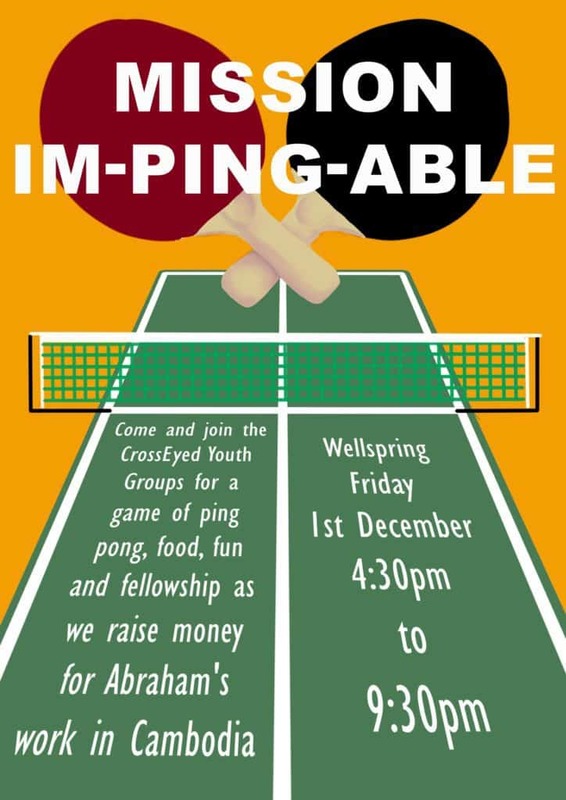 Wellspring and CrossEyed youth group present…Mission Im-ping-able! As a church, Wellspring supports the work of Abraham and the Development of the People of Cambodia (DPC). You can read more about the work of the DPC in Cambodia via http://www.wellspring.org.au/cambodia/. The CrossEyed community are running Mission Im-ping-able to support education of the children in Andong Village and Oddar Meanchey Province. Our festival extravaganza, in addition to non-stop ping pong for 5 hours (! ), will include many fun-filled activities and challenges for all ages. To contribute you can head to Give, then ‘Click to give online’ and select the ‘Cambodia-Mission Im-ping-able’ option, or you can transfer donations by direct deposit (Account Name: Parish of Wellspring Cambodia, BSB: 067-102, Account Number: 1028 6330, Ref: pingpong) or bring money to spend at the event!